inPhoto ID SLR / inPhoto Capture SLR is very easy to install and run. To install inPhoto run inphotoidslr.exe / inphotocaptureslr.exe and follow the instructions you will get. Activate your license using on-line or off-line activation (software activation)and enjoy working with inPhoto ID SLR / inPhoto Capture SLR. Insert batteries to your Canon camera or connect it to power using standard power supple cable. Install your Canon camera on the tripod photo stand. Remove a cap from the camera lens. Connect your Canon SLR camera to PC with the USB cable. Turn the camera on. 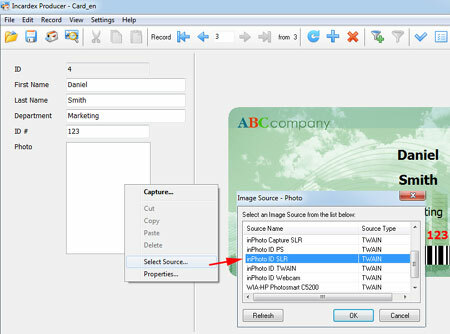 In order to be able to use inPhoto ID SLR software to control your Canon SLR camera from computer and make ID photos, connect your camera to PC with USB cable, switch the camera on, run TWAIN compartible ID card application (e.g. Incardex), and start inPhoto ID SLR software as TWAIN driver from within this applications. The live image shall be displayed in the software window. Canon SLR cameras having live image preview ability shall be set in “Auto” (P) mode. The live image preview will not be displayed in the software window if Canon SLR camera is set in “Full Auto” mode or any of the special modes. Canon SLR cameras having live image preview ability shall be set in “Auto” (P), “Exposition priority” (Tv), “Aperture priorirty” (Av), or “Manual” (M) mode. The live image preview will not be displayed in the software window if Canon SLR camera is set in “Full Auto” mode or any of the special modes. Your Canon SLR camera is installed on the tripod stand. inPhoto ID SLR software is installed on PC. Canon SLR camera is turned on, connected with the USB cable to your PC, and set in “Auto” (P), “Exposition priority” (Tv), “Aperture priorirty” (Av), or “Manual” (M) mode. Now you can run inPhoto as TWAIN source from all TWAIN compatible applications. If you work with Canon SLR camera from any TWAIN compartible ID card software (Incardex, CardFive, Asure ID, ID Works, EPISuite, ID Flow, etc.) select image acquisition source (inPhoto ID SLR / inPhoto Capture SLR) and capture photos directly to ID card software via inPhoto TWAIN driver. If you work in other graphic applications supporting TWAIN please refer to the corresponding documentation supplied with your graphic software. After inPhoto is started up you will get the live image in the image preview window.